2. Taking an antihistamine (i.e. Benedryl or Zyrtec) wonA co't help an anaphylactic reaction (and taking them daily won't protect you from a reaction either). The only thing that will surely avoid a reaction is avoiding the allergen itself. So again - what IS a food allergy? Rather than trying to summarize and explain - take the 2.5 minutes of your life and watch this short video from the National Institute of Allergy & Infectious Diseases (NIAID). It explains what happens in your body when you have a food allergy. Back? Got it? OK, great. So for those that skipped the video - when your body thinks that a common food (such as eggs, milk, peanuts, treenuts, soy, fish, shellfish, or wheat... or maybe even sesame) is an enemy, it sends out Immunoglobin E (or IgE) to attack it. When it does that, your body has attacks it and you have an allergic reaction. In some cases, this reaction can become anaphylactic and if not treated in a timely and effective manner - fatal. 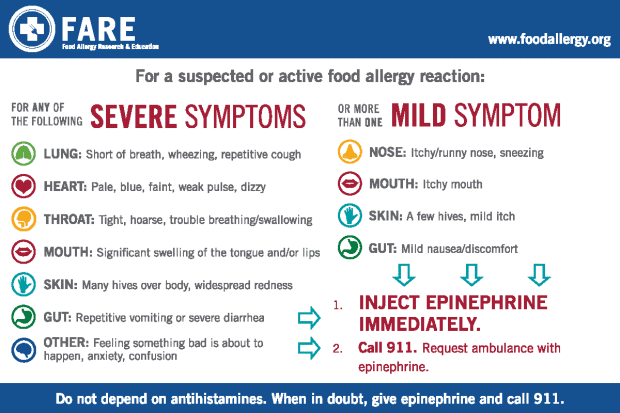 Here are a couple of graphics that I find really useful when it comes to determining what symptoms to look for as well as when to determine whether or not to use an epinephrine autoinjector. This is so important to have in the back of your mind when assessing a reaction. When in doubt, our default is to inject and call 911 - at least you've done ALL you can. So you're out with your friends and their son has an allergy to say... peanuts. She leaves to go to the bathroom and asks you to keep an eye on her son - reminding you where the epinephrine autoinjector (the EpiPen or EpiPen junior are the most commonly used autoinjectors) is located. While she's gone - maybe the bathroom is far away or she's changing another child or there's a line or something, but she seems to be gone a while - her son somehow manages to ingest peanut products. Maybe he snuck a bite of a friend's sandwich or whatever - it doesn't matter. He's started to vomit profusely and looks so pale that he almost looks blue. Not wanting to take a chance, you go in her bag where she keeps his autoinjector... now what do you do? Besides knowing the symptoms to look for, the next best thing you can do as a part of "the village" is to know how to use an autoinjector - preferably the one that your friend carries, especially if you're with them often. For the purposes of this post, I'm going to give you a graphic and a simple explanation of how to use the EpiPen/EpiPen Junior. 1. 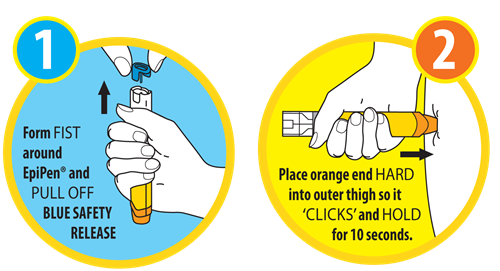 Remove the EpiPen from it's case and grip it in your fist - DO NOT put your thumb or fingers over either end. The last thing you want to do is accidentally stab yourself. 2. Remove the blue locking cap from the top end - "blue to the sky". 3. HOLD DOWN THE PATIENT if they are a child (they will likely fight you) and stab AND HOLD that thing as hard as you can into the meatiest part of their thigh MAKING SURE TO AVOID RECOILING THE PEN. Recoiling it will just make medicine fly everywhere not not actually administer it to the patient. COUNT TO TEN SLOWLY and remove the pen. 4. Massage the spot where you've injected the pen, lay down the patient, and elevate their legs. If they are vomiting or their tongue is swollen - lay them on their side. 5. IMMEDIATELY after doing this call 911 (preferably from a landline, but know where you are if you're calling from a cell) and tell them you have a person who is having an anaphylactic reaction and need an ambulance immediately with epinephrine stocked as well as someone who knows how to administer it. This may sound like something they SHOULD know how to do - and many do - but always say it just incase. 6. NOW contact the parents. 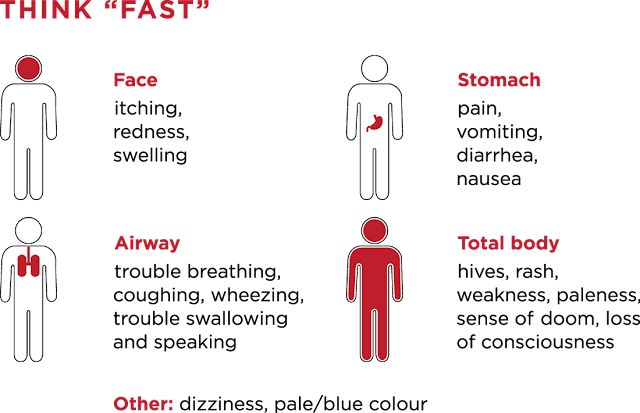 Always administer medical care and get medical attention first in the case of a suspected anaphylactic reaction - every second counts. 1. Food allergies are a medical diagnosis and not a lifestyle choice. 25% of people believe they have food allergies, but only 3-4% actually have a medical diagnosis. That might seem crazy, but it gives an impression that this might be a lifestyle choice. It is not - and even some of that other 21-22% probably have some sort of an allergy that's never been diagnosed. Don't take it lightly. 2. People with food allergies are not suffering. 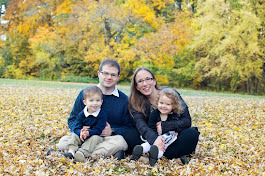 My son is far from suffering - he eats things normal kids eat, he's going to play soccer in the fall, he jumps around playgrounds and climbs like a monkey. He is normal in every other sense... ok, he's short... but other than that he's normal in every other sense. He's NOT suffering. He just can't eat peanut butter and most treenuts. Meh. 3. I don't want you to change your life for my kid. I just want you to be aware and I want you and his friends to help protect him. I know that not all parents or people with food allergies agree with this - but the reality is that when my kid is in college, his roommate might keep a jar of peanut butter in the room or he might date a girl at some point who loves nuts. I want him to know how to handle and navigate the real world. So there you have it - the basics of food allergies. Have any questions? Leave a comment, drop a line, or check out the massive amounts of resources on the FARE website.